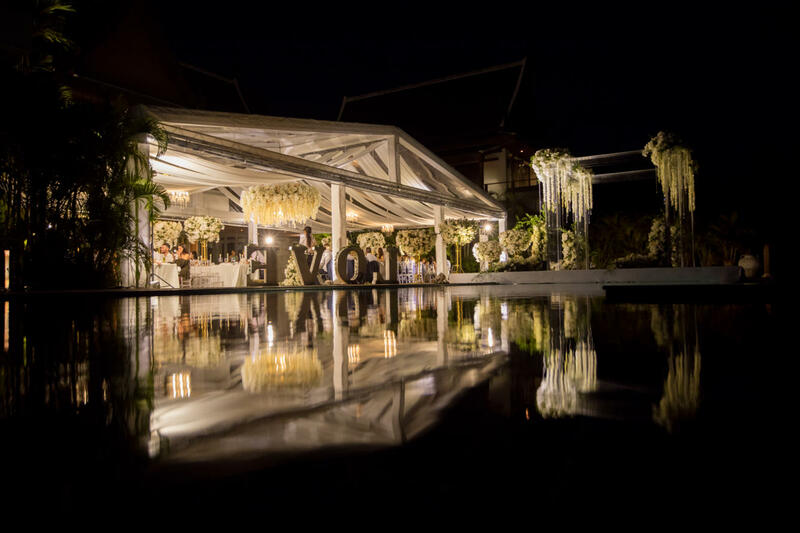 Getting married in tropical Thailand in July presents an iffy affair with a high chance of rain. 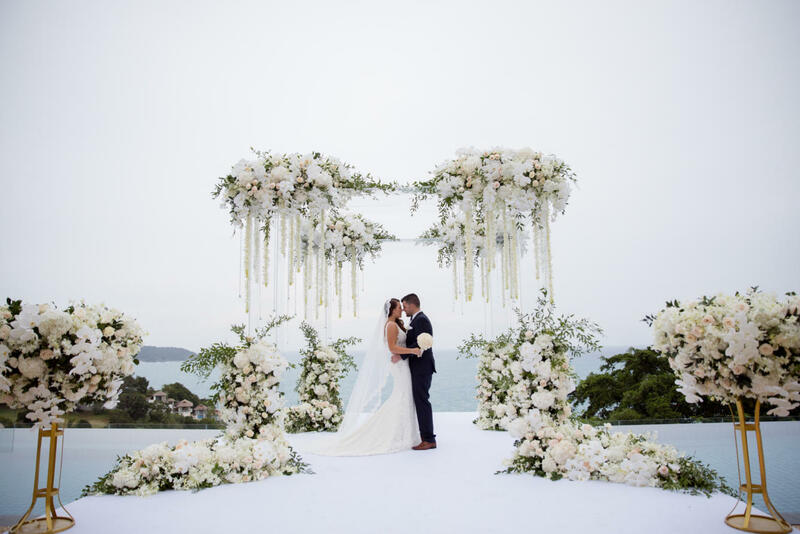 However, that did not stop Nip and Beau Reid from hosting a grandiose private affair against the background of the Andaman Sea, along with the beaches of Phuket in 2017. 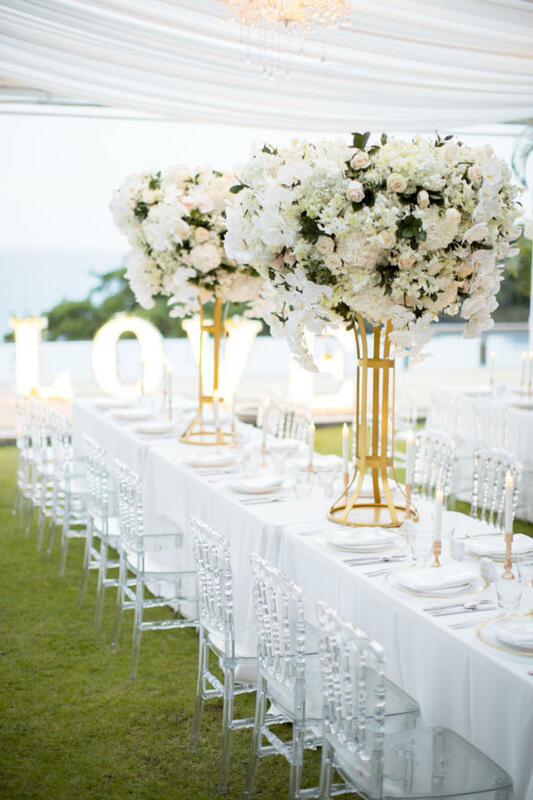 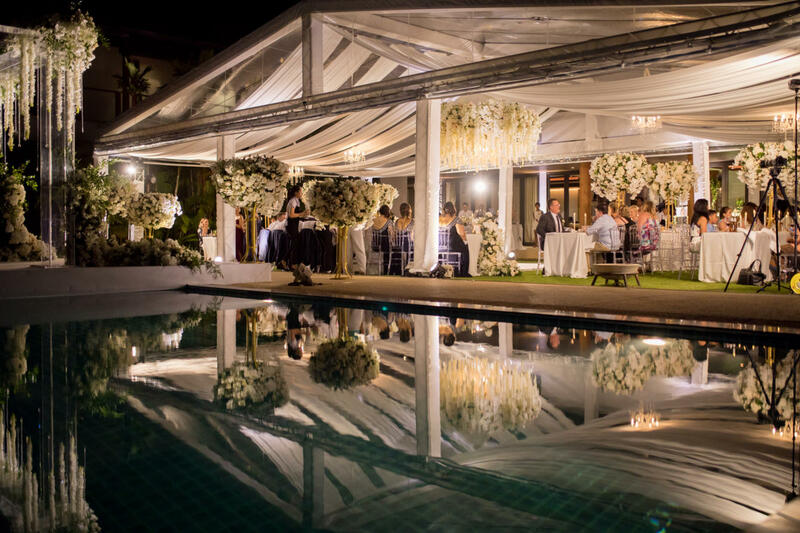 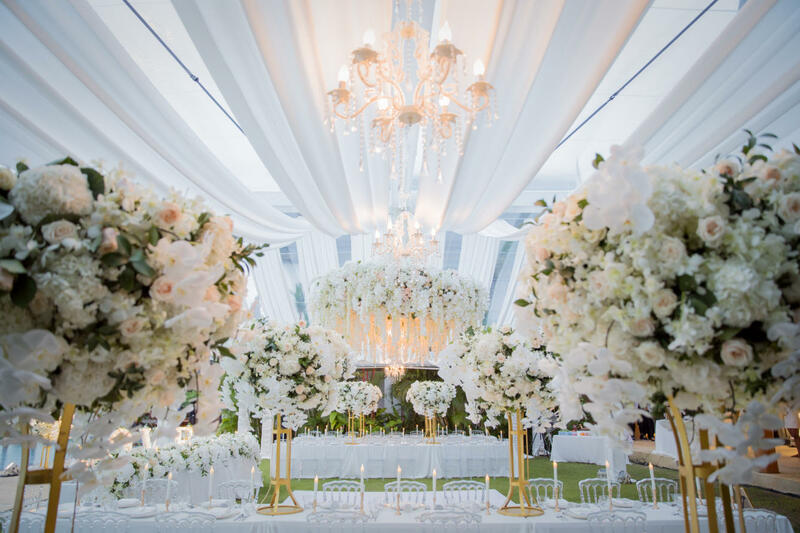 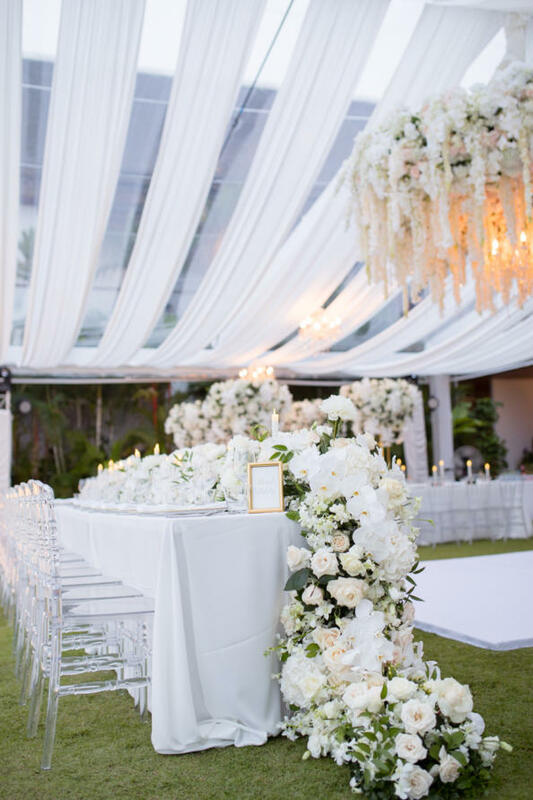 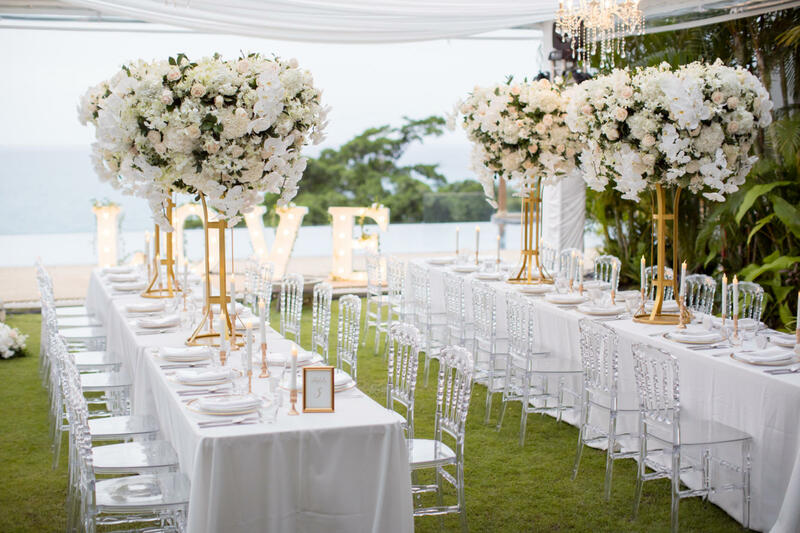 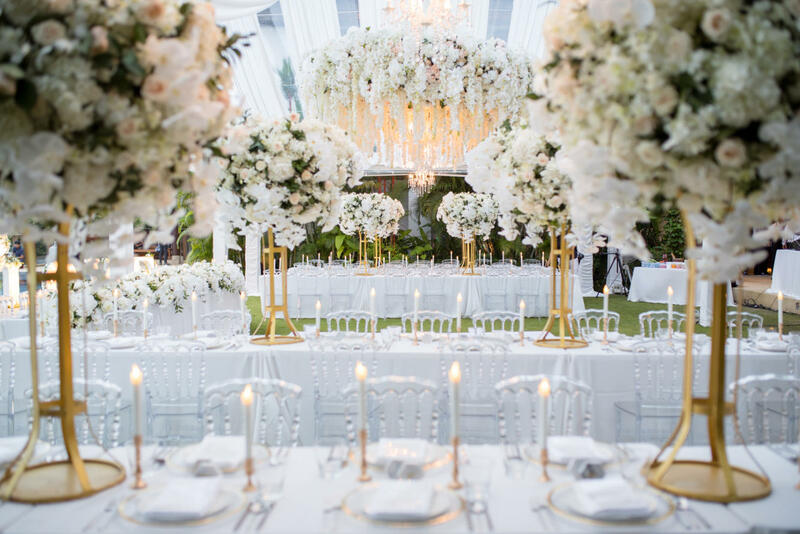 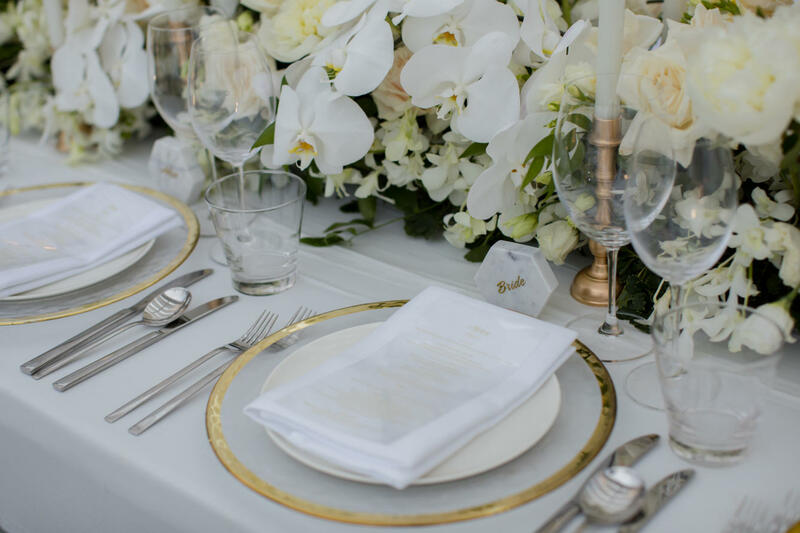 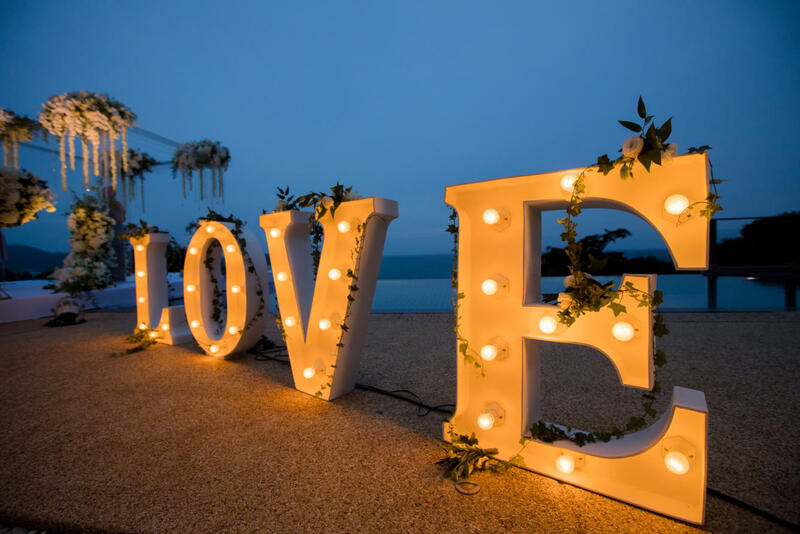 Nip who hails from Thailand made white, with tinges of green and gold as theme colours to her event and with the help of The Wedding Bliss Thailand, it was a romantic, luxurious and fun event. 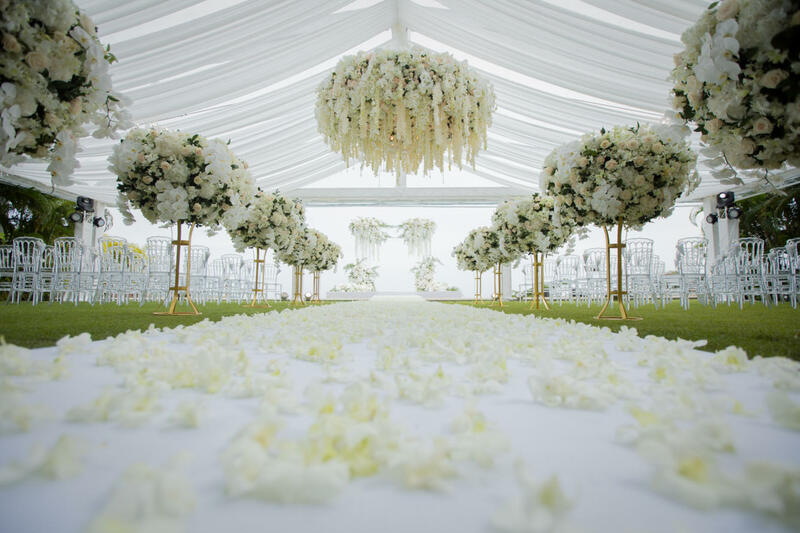 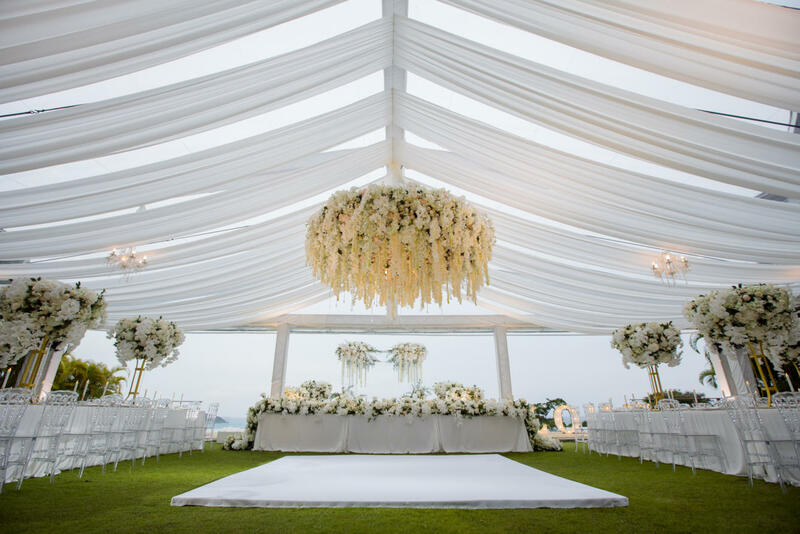 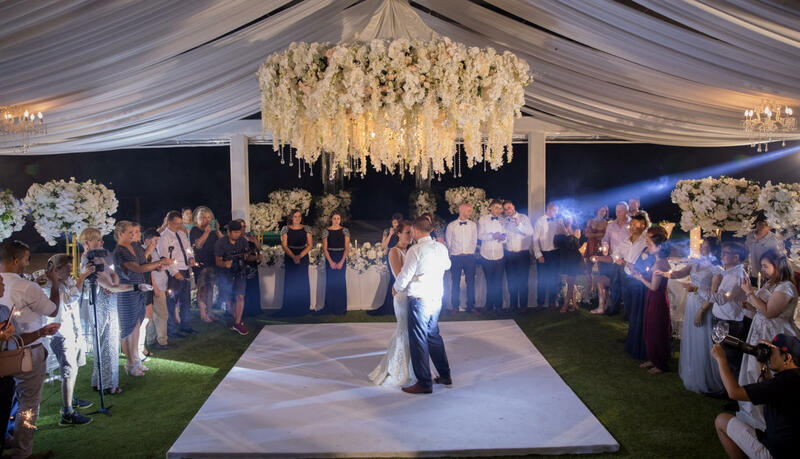 The team set up a massive overhead structure decked with draping to help if the wet weather showed, and hordes of white flowers to form the wedding arch. 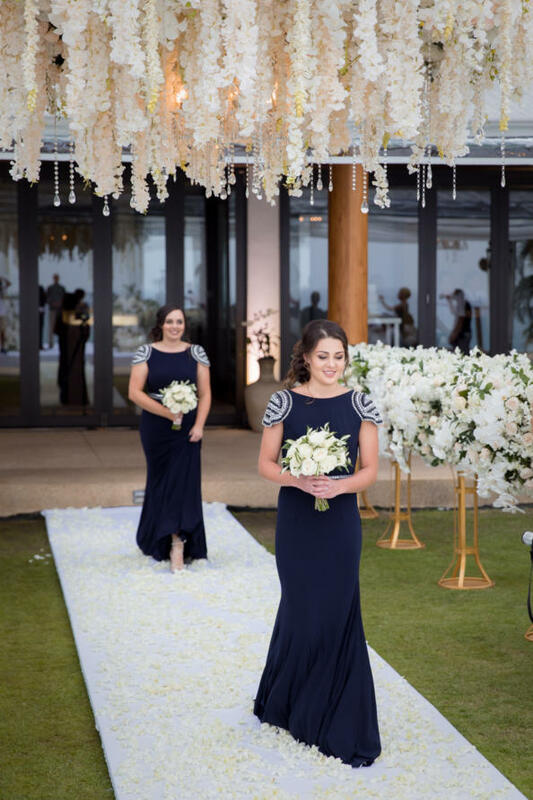 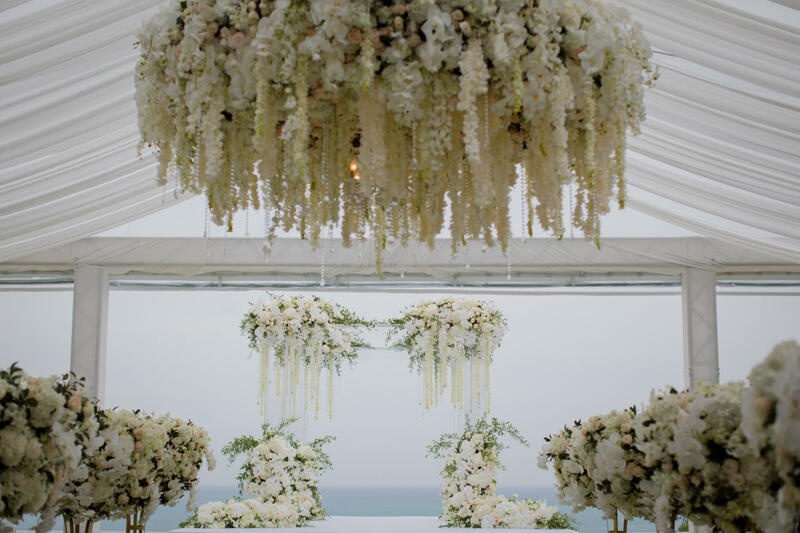 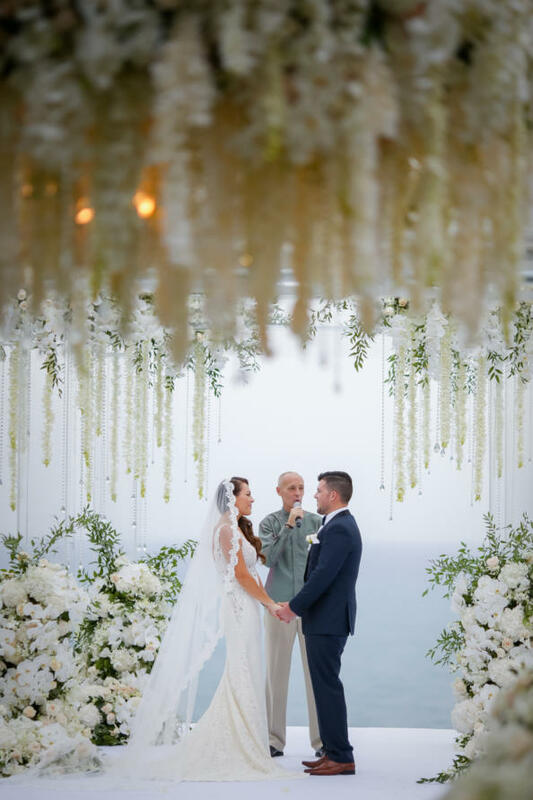 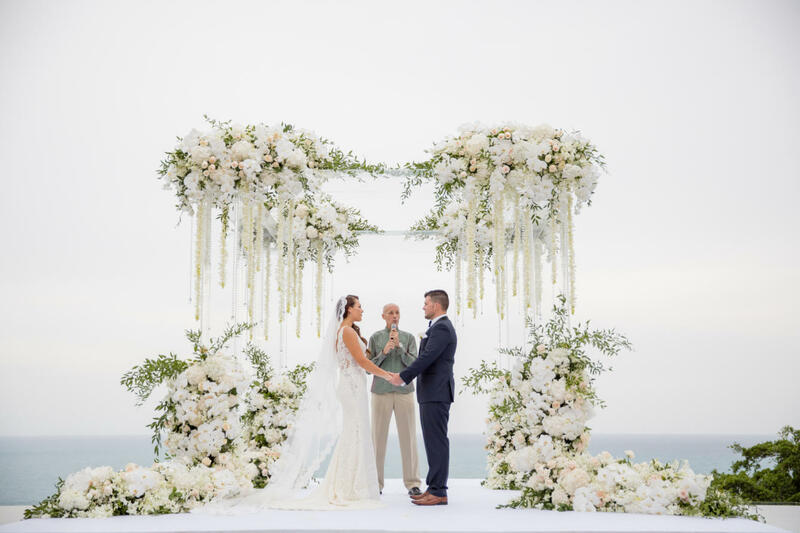 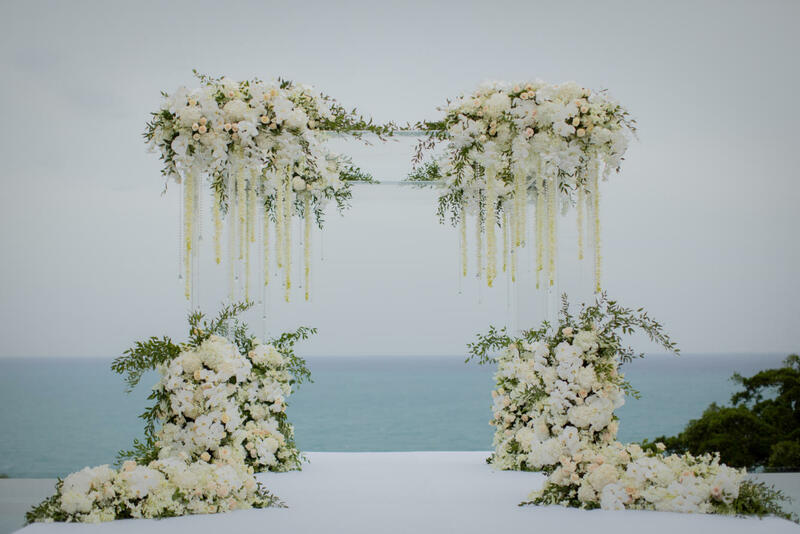 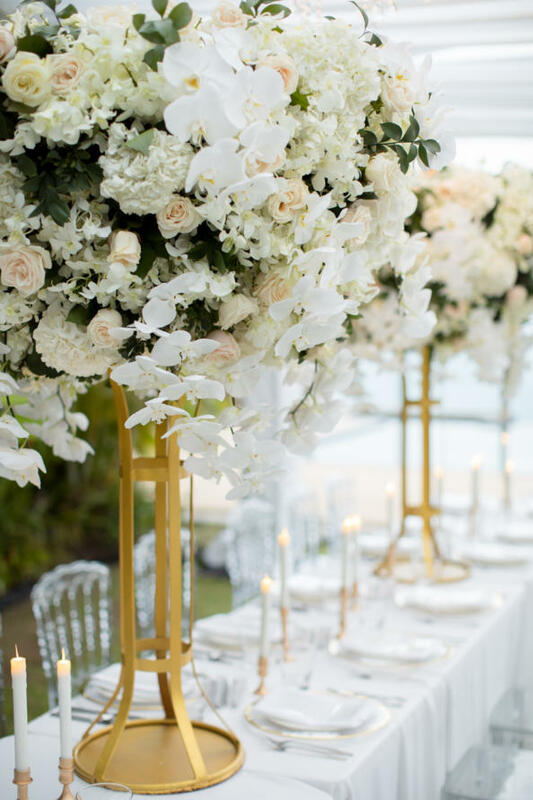 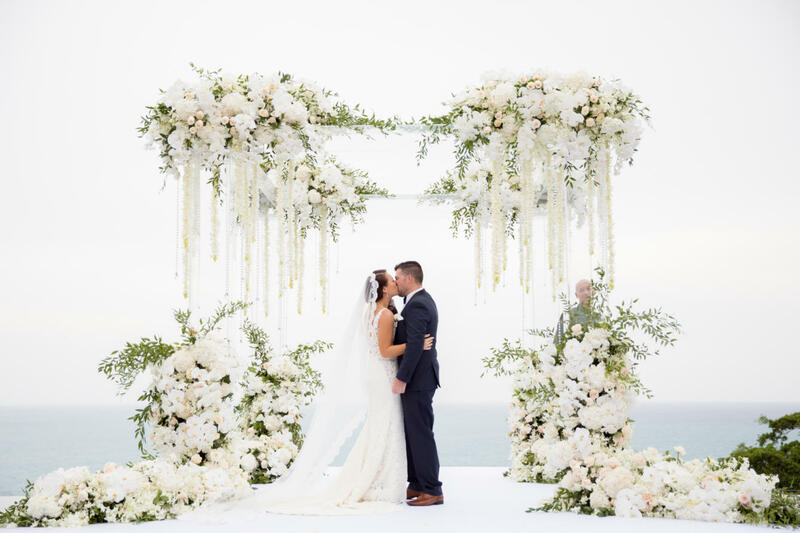 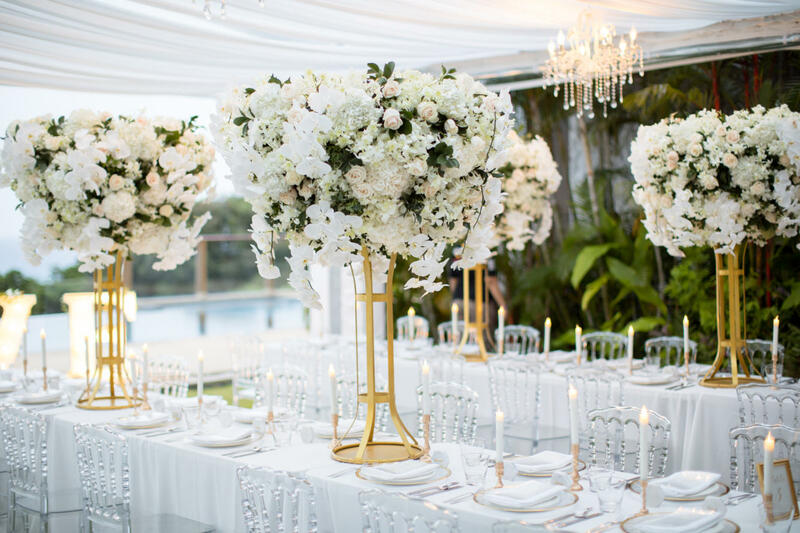 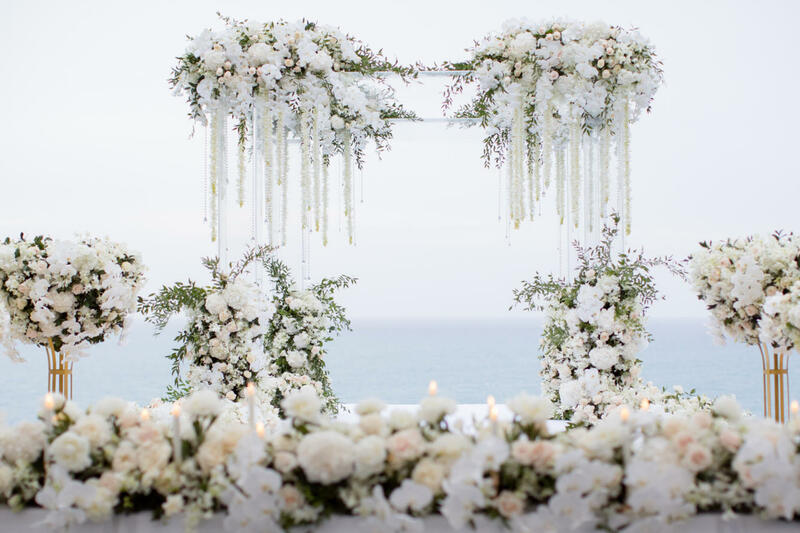 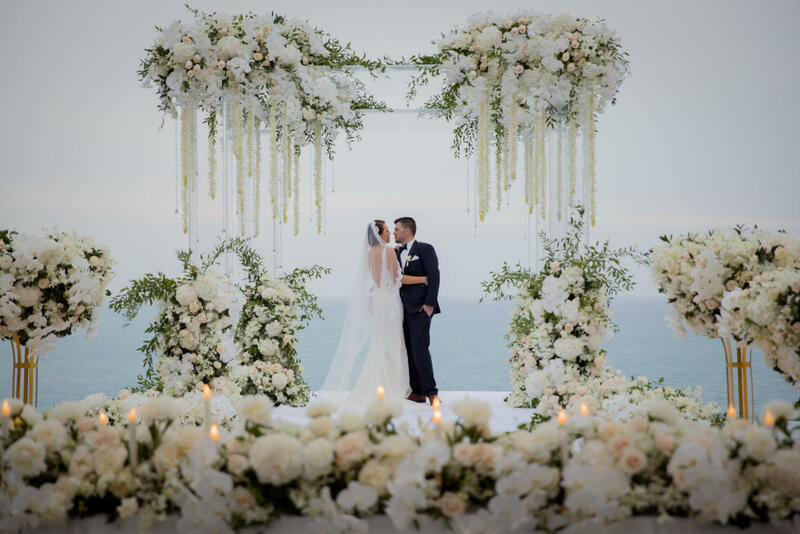 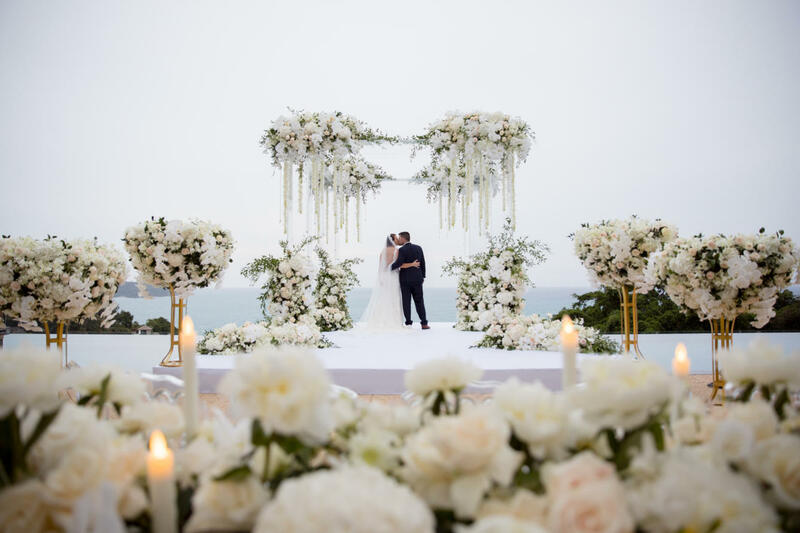 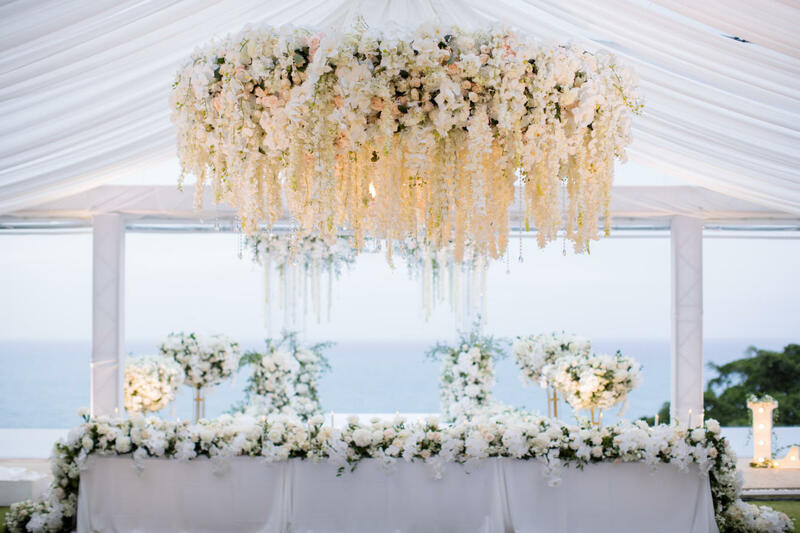 The blooms were also in walkway stands and were the highlight of a statement floral chandelier which bestowed a dreamy vision against the cerulean colour of the ocean. 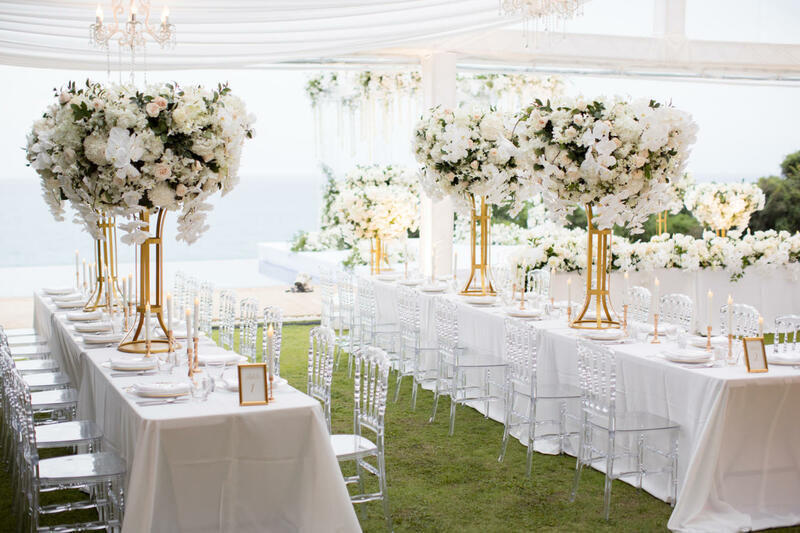 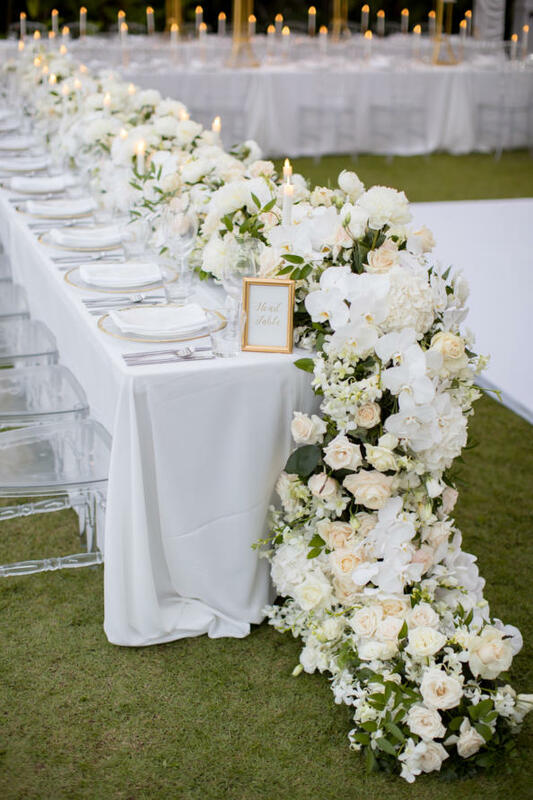 Crystal clear chairs were set for the guests to witness the ceremony. 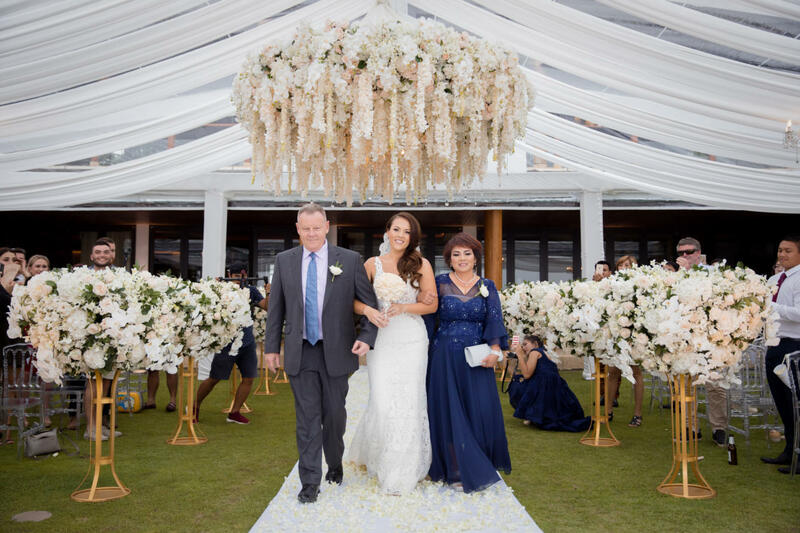 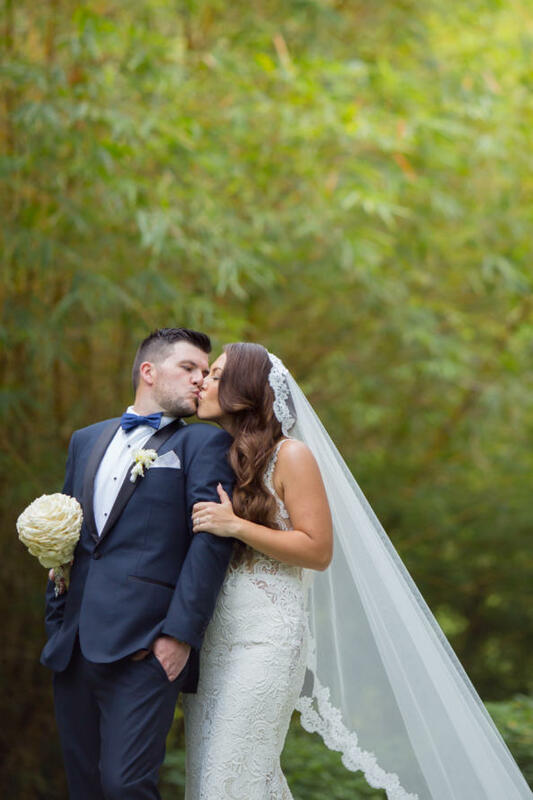 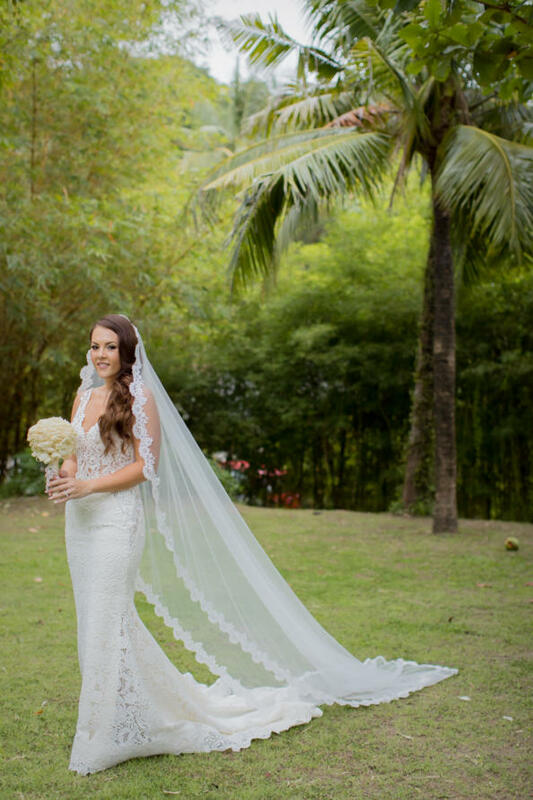 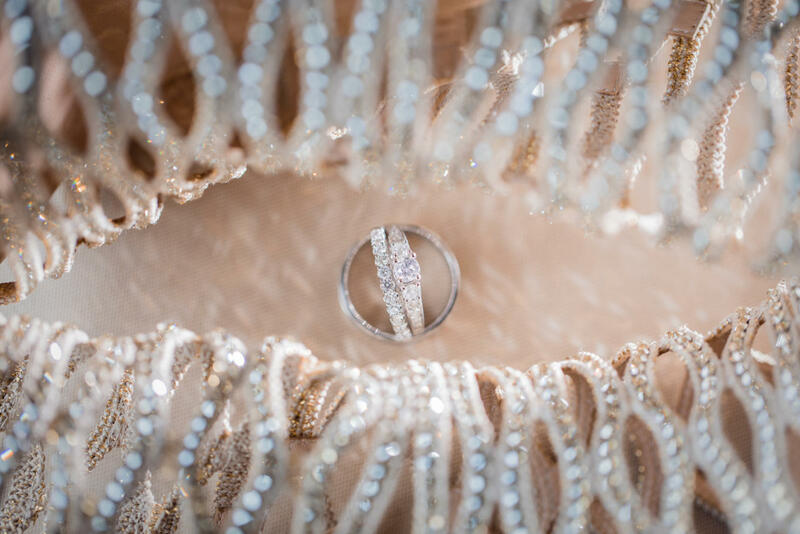 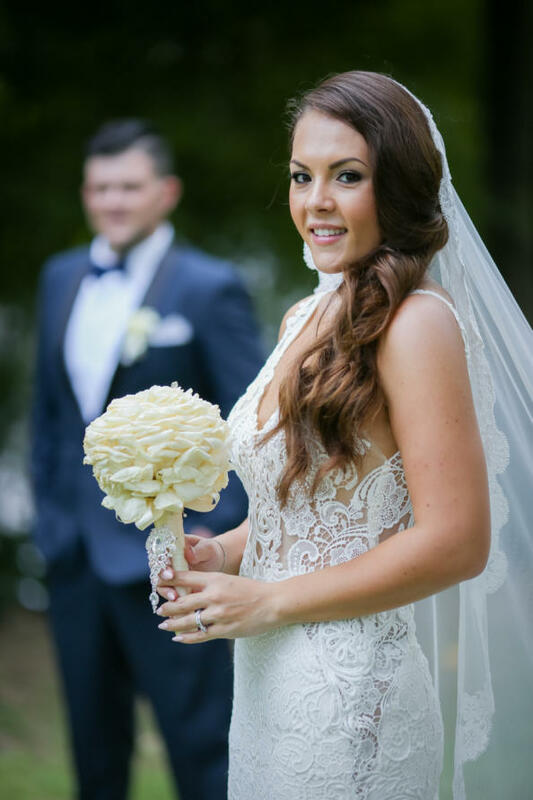 Dressed in a lacy but elegant high-low gown, complete with rose-gold based rhinestone strappy sandals, Nip’s beauty wowed her groom. 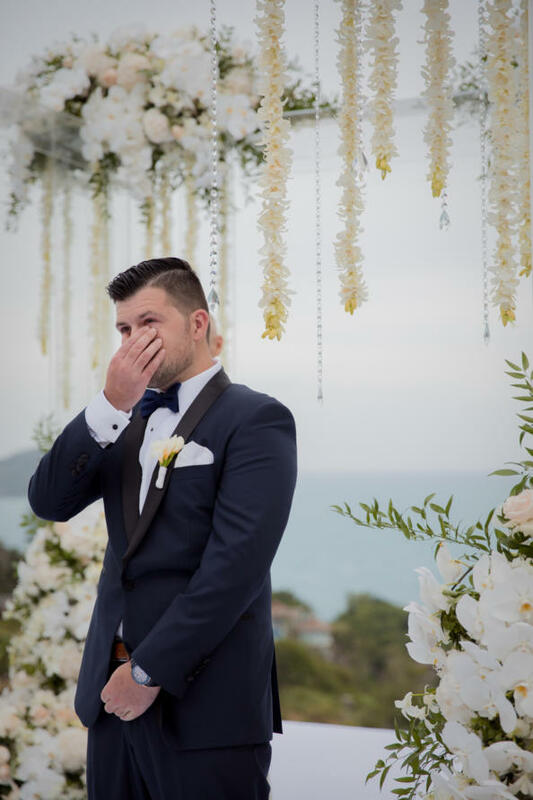 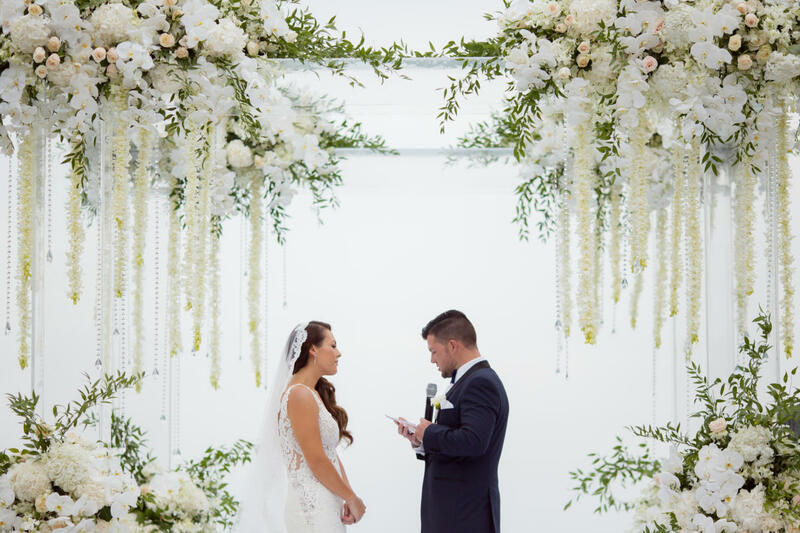 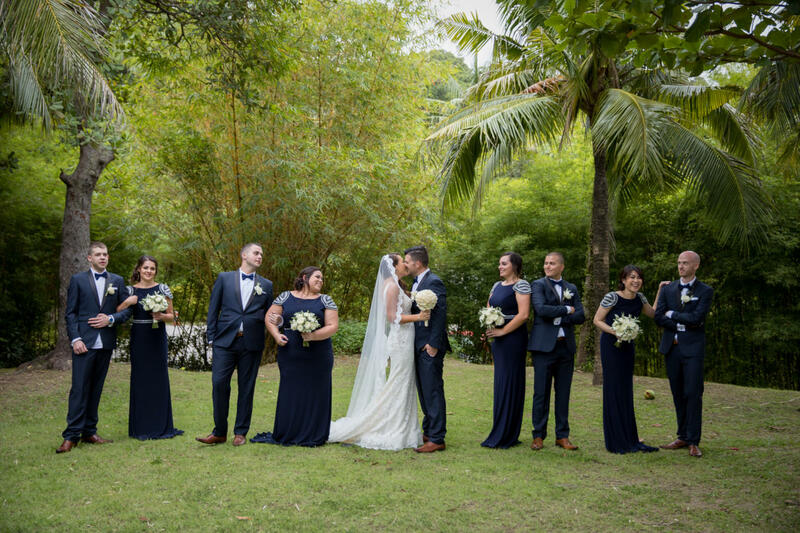 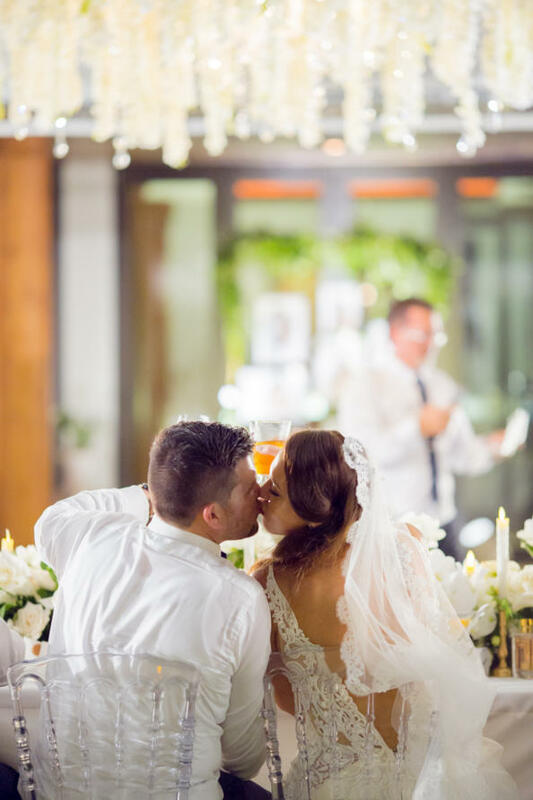 The sharing of vows was a touching moment as the couple shed tears in their promise to love each other till death parted them. 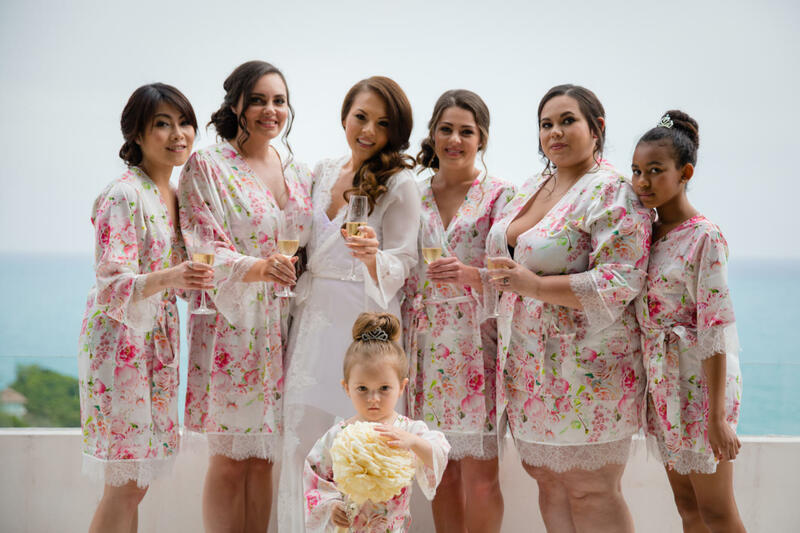 The Australian couple’s daughter, Akira, held the limelight of the wedding having participated in the pre-wedding fun with the bridal party. 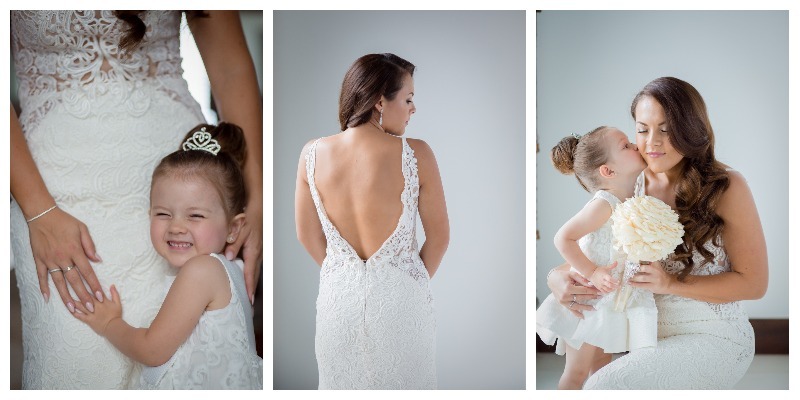 For the ceremony, the toddler was clad in a white lace dress, gold-sequinned ballerina shoes, and a tiara that fit the princess-worthy occasion. 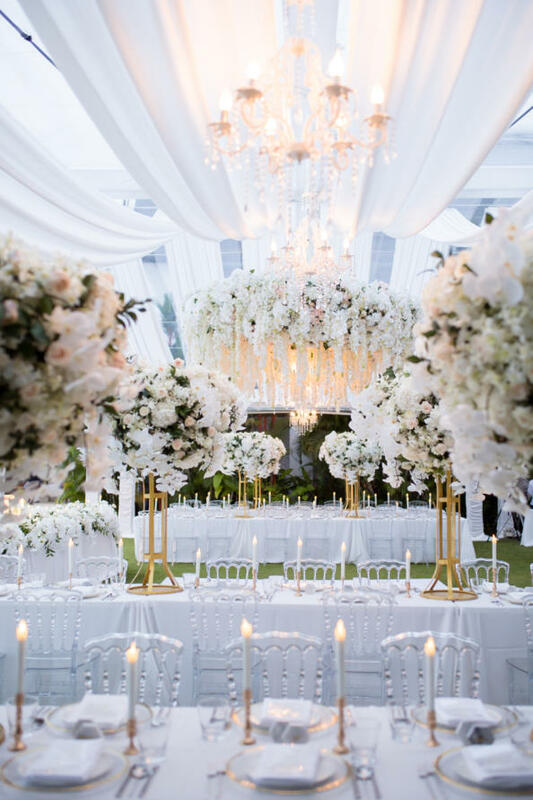 The dinner reception was held at the same venue but even with the need to redecorate, the magnificence of the venue was in no way impeded upon. 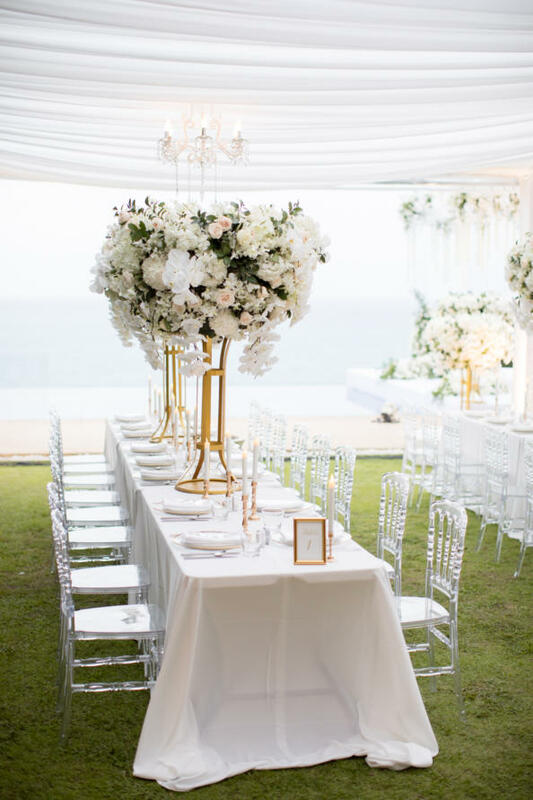 Three long tables, with the same clear chairs for seating, were placed alongside the space’s edges to provide a large centralised dance floor. 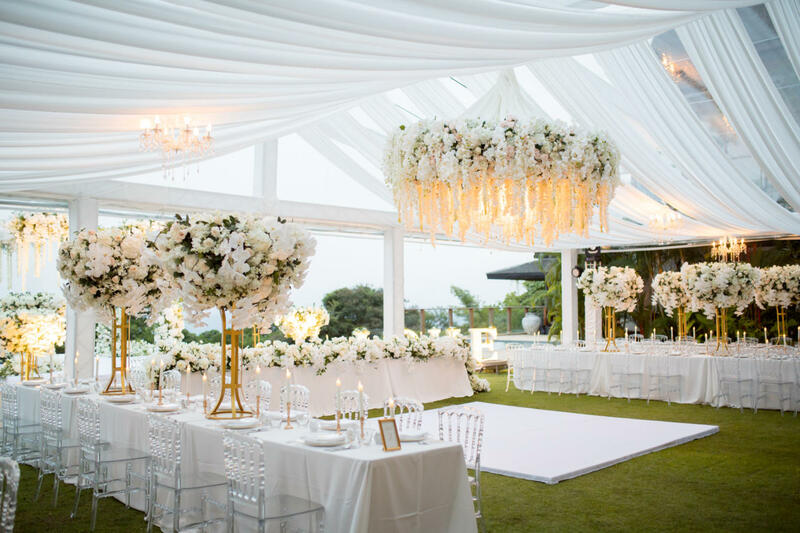 The lighting for the evening enhanced the luxurious feel of the setting that ended in a happily-ever-after for the couple and their guests.